On Saturday I went to the Sydney Opera House to see the Sydney Philharmonia Choirs perform "An English Christmas" concert . It was a lovely concert, thoroughly enjoyable with some angelic voices . 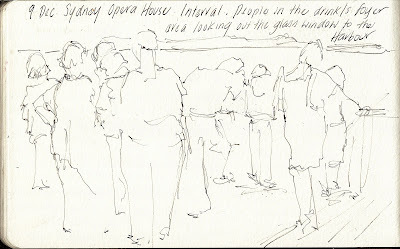 I sketched on the way, at interval, and once during the concert . I sat next to another lady who bought out a sketchbook too ! and then I met choir friends for drinks afterwards. All in all it was a very enjoyable afternoon. I was unsure of what time and opportunity I would have to sketch, but I carry my sketchbook, watercolour pencils and Lamy Safari Ink Pen with me everywhere I go, just in case. As it happened, I only had time for ink in each case. The exterior of the Sydney Opera House is immensely sketchable from any angle! 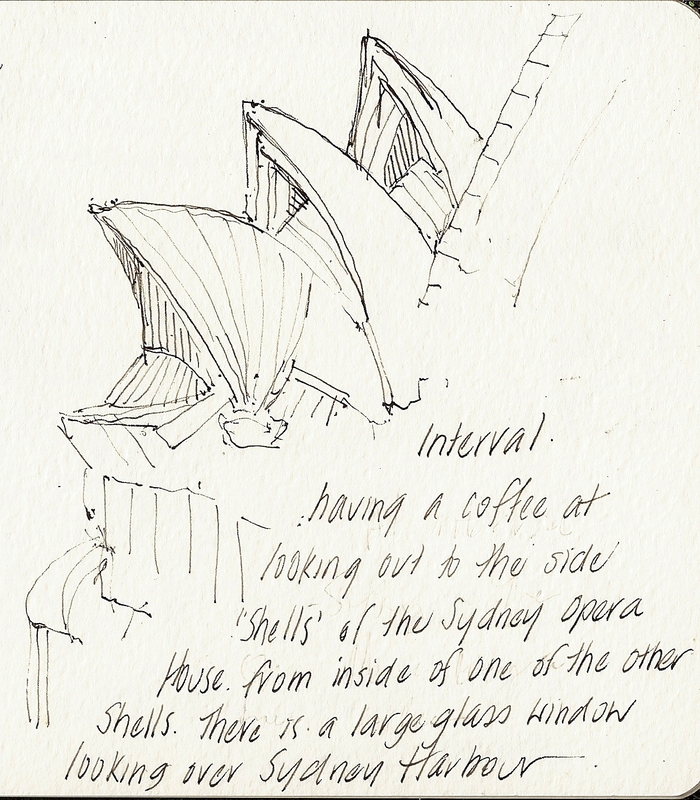 My first sketch was as I walked up there from Circular Quay. The day was so grey and the wind was very blustery, that I did not spend much time at all, wanting to get inside as soon as possible. 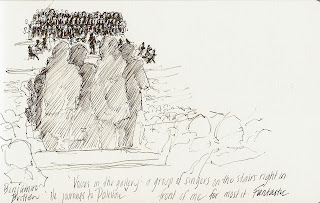 The second sketch was once I seated inside (way at the back). I was on an aisle seat, and no one sat on the otherside of me until the last moment, so I felt free to sketch. I started with the organ, thinking that even it got no further, I would have something down on paper. I was fortunate to get about 15 minutes of sketching in,before the lights dimmed. 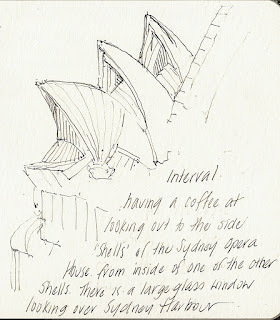 The next sketches were at interval, sitting in the drinks/ foyer area inside the Concert Hall shell, looking out through the large glass sections out onto Sydney Harbour. I thought it was important to sketch some people too. 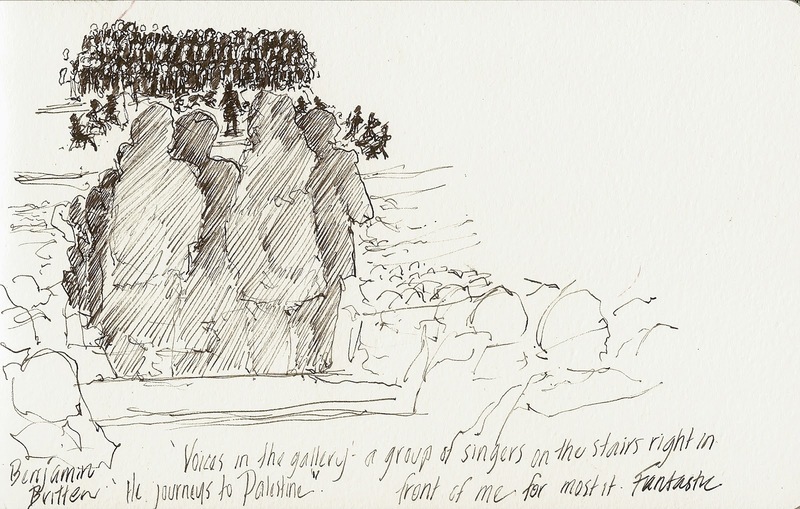 And finally during the concert group of about 12 singers moved onto the stairs infront of me. Their silhouettes were too tempting to draw and I got my pens out straight away. 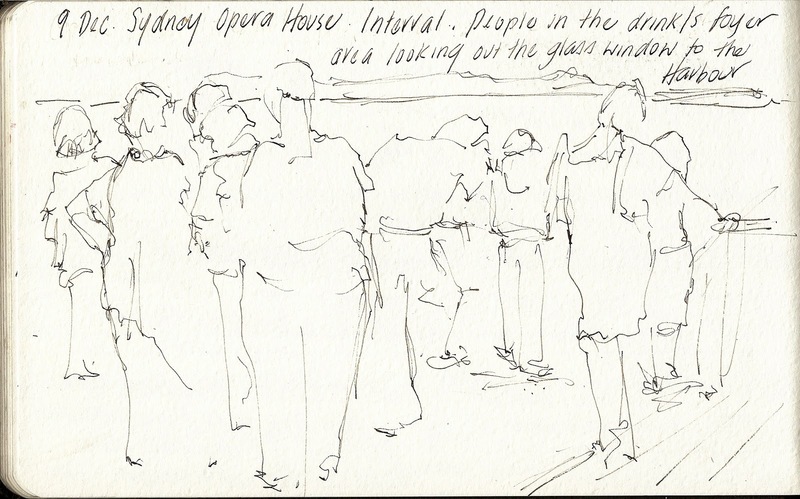 Then I quickly sketched some audience members and then the orchestra and choir. Then my sketchbook was put away and I sat back to continue enjoying the glorious singing and music.